Alice “Skip” Steudler sat in the middle of a circle of toddlers leading them through musical games. Over with the preschool-age kids, Betty Kuhn watched in one corner as a boy sprawled out on the floor with dozens of toy cars. Next to them, Joe Finger and his little buddy Grayson Pavlichko worked on pictures they were painting together. Several kids lined up to talk with Loretta Drolet about their little toy animals. And out on the playground, Leon Hutton tended to a pile of sticks that served as a make-believe fire. The unusual thing about these volunteers? They are all at least 79 years old. Skip is the youngster of the group. And the oldest? That’s Loretta, who turned 100 in August. They come from St. Anne’s Retirement Community in West Hempfield Township, and their visits are coordinated by Hope Long, activity director at St. Anne’s. 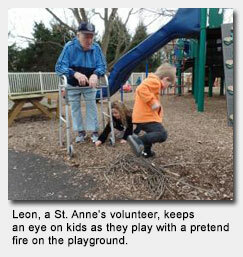 All of the St. Anne’s volunteers are parents and grandparents, and they all said they enjoy the visits to Schreiber because they like being around the kids. Loretta was impressed by how smart the kids are. 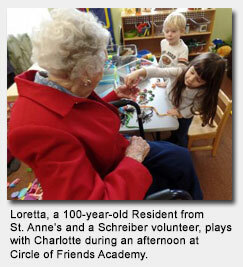 She recalled one of the children showed her the little animals she had been playing with. “I said, ‘That’s a doggie.’ And she said, ‘It’s a Dalmatian,'” Loretta said. Her friends from St. Anne’s are just as impressed with Loretta. Leon admitted he needed a little bit of inspiration in the past year. His wife, Irene, passed away in January of 2016. They had been married 62 years. That’s exactly the kind of reaction Christina Kalyan hoped for when she introduced the program about a year ago. Christina is director of Circle of Friends. She said she thought the kids and the St. Anne’s folks could all benefit from getting together. The initial group was made up of a half dozen or so St. Anne’s Residents who have come over once a month (missing occasionally because of weather or schedule). Hope has brought in more Residents for the visits, and she and Christina both said they’d like to add a second visit each month. 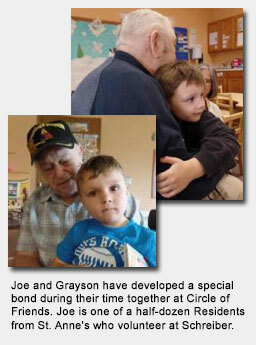 Back in the preschool-age room, Joe and Grayson had finished their paintings, exchanged them and gave each other a hug. These two formed a special bond from Joe’s first visit. Grayson is more than happy to sit on Joe’s lap and just hang out. And Joe’s gruff exterior crumbles away when he talks about his young friend. “When we see each other and I leave, he makes me cry,” Joe said. No, this is definitely not your typical volunteer group. Originally published on February 28, 2017 on schreiberpediatric.org.